Reviewed on page one of this post. Blister issues slowed Gore’s production in 2018, but he still has a very high ceiling. The mix of pitches he features is deadly. He is also armed with a mid to upper 90’s fastball, and he likes to pitch with an edge. Gore could very well be an ace of the future. He has that type of upside. The Padres went back-to-back catchers with their second and third picks of the 2017 draft. Campusano was selected out of high school and was widely regarded as the best catching prospect in the draft. The bi-lingual catcher is a son of a former minor leaguer and comes with a plus bat. He has excellent defensive abilities as well and performed well last year in Fort Wayne as a 19-year-old putting up a .710 OPS in 70 games. Of the two catchers drafted in 2017, Hunt is slightly better defensively. The large catcher is widely considered one of the best defenders in the system and has improved in every year he has played. Hunt has power but tends to get slightly too pull happy with his approach. At times last year in Tri-City, Hunt showed a plus bat, so there is plenty to be excited about in regards to his future. This left-handed hitter has a beautiful swing. He generates a lot of power to all fields when he makes contact, but he does struggle with the strikeout. House did not do well last season out of the desert. Expect him to start in Fort Wayne this year possibly. There is a lot to like with his game, but he does need to refine his approach at the plate a bit. Margevicius has been stable since the team drafted him out of Ryder University in New Jersey. He continually strives to get better despite the fact he does not light up the radar guns. He typically sits in the low 90’s, but he spots his fastball well and has excellent offspeed pitches. The left-handed pitcher also understands how to use different plains of the strike zone. He is a bulldog on the mound. Flying under the radar is this left-handed pitcher from Hawaii. 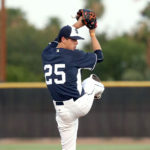 He has a funk to his motion and is starting to develop his mechanics under the tutelage of major league coordinators. Cantillo has plus size and a plus arm. 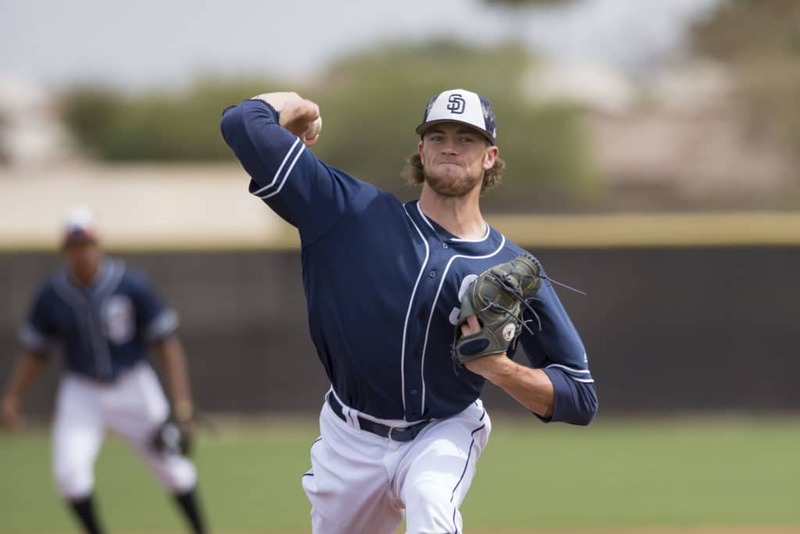 In time, he could be a real factor in the upper minor leagues for the Padres. 19-year-old infielder Jason Pineda has done well since being selected out of high school in New York. He has shown an ability to walk, but still, need to make more contact. The power seems to be coming as he gains weight and gets bigger. The third baseman is stable at the corner but has also played some first base for the team. Speed is Podorsky’s main contribution as he is extremely fast on the baseball diamond. The short in stature, right-handed hitter, has a compact swing. The 23-year old put up a .883 OPS in Fort Wayne last year in 2015 at-bats. He is a solid defender and a plus bunter. Podorsky is fun to watch as he brings an old school element to the game that is hardly seen. This left-handed pitcher has plus intangibles. He comes from a baseball family and has an understanding of how to pitch. His stuff is getting better as he gets professional coaching. Weathers has an excellent command of his three-pitch arsenal. The 19-year-old should start in Fort Wayne but could be in the California League before you know it. Switch-hitting infielder Xavier Edwards is exciting to watch. He has 70-grade speed and provides a plus bat from both sides of the plate. Edwards could be a special talent in the game. Defensively, he could stick at short though he is fully capable of playing second base. The 19-year-old will start in Fort Wayne and could be one of the league’s better players. This Texas product has struggled with the bat since being drafted. There is still time for him to get better, but there needs to be an improvement from Little in regards to plate discipline and approach. He has plus defensive abilities and runs very well. Miller has been impressive since he was drafted out of Illinois State. He made it to Double-A (playoff push) in his first season, though he may start in Lake Elsinore this spring. That remains to be seen. He regularly barrels up baseballs with his short, quick right-handed swing. He can play all over the infield, though he probably doesn’t have the arm for third or short at the higher levels. He looks to be a solid second base candidate for the team. This hard-throwing right-handed pitcher out of Missouri State has excellent stuff. The Padres will leave him in the relief role, where he could eventually develop into a closer. Coleman made it to Fort Wayne last year where he performed well for the TinCaps. At the time of this trade, most of the hype surrounded Javy Guerra and Manuel Margot. 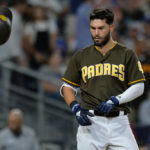 Carlos Asuaje was also in the deal, but the Padres need for a shortstop of the future was supposed to be solved by the acquisition of Guerra. In the end, Logan Allen an 18-year-old (at the time) pitcher might be the best addition made by the team. This trade is the big one. They will probably be talking about this for years to come. The Padres had interest in Tatis the year the White Sox signed him. Preller wisely waited in the wings until the time was right to wrestle the infielder away from Chicago. The Padres paid roughly $38 million to the Sox for Shields contract, so Tatis was not a cheap addition. The Marlins were attempting to make a playoff run and needed relief help. Fernando Rodney had been terrific for the Padres to start the 2016 season. Preller and his staff wisely sold high on Rodney, acquiring Paddack from the Marlins. Not much was known on Paddack at the time, except that he was very young and full of potential. Pomeranz was an all-star, and the Padres did well to sell high on him. The Red Sox stunningly parted with Espinoza who was widely considered one of the best right-handed pitching prospects in the game. Pomeranz, immediately reported arm issues which was not shocking news as he had already eclipsed his highest innings total for a season at the time of the trade. Espinoza required Tommy John surgery eventually. This trade is not talked about much as Rodriguez had arm issues last year. At one time he was considered a top 30 prospect in the Padres system. The 22-year-old relief pitcher has excellent stuff and could emerge in time as a factor for the team in the bullpen. Just another example of handpicking a player from another teams roster. 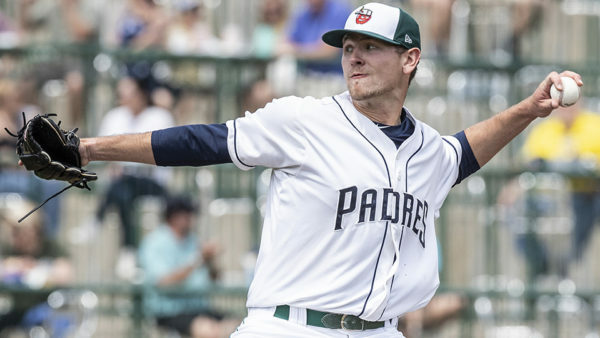 Almost one month after the Padres acquired Chris Paddack, the Marlins traded the Padres another one of their better prospects. Canadian slugger Josh Naylor was sent to the Padres for Andrew Cashner. Naylor is blocked at the moment at first base but has played outfield for the last 12 month or so. His bat is almost major league ready. He needs a position. The Royals dealt Travis Wood, Matt Strahm, and Esteury Ruiz to the Padres for Brandon Maurer, Trevor Cahill, and Ryan Buchter. 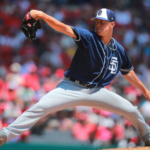 Ruiz himself is a steal for the Padres, but to get five-plus years of service time from Matt Strahm makes this trade a steal for the Friars. None of the three pitchers traded to the Royals in this deal are still with the team. Yangervis Solarte was a favorite in the locker room, but he was shipped to Toronto before last season. 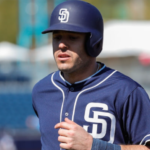 The return was a skinny outfielder who has progressed with the Padres since they acquired him. Olivares was protected this winter on the 40-man as the Padres have high hopes for him. With more muscle, Olivares could turn out to be a decent corner outfielder. 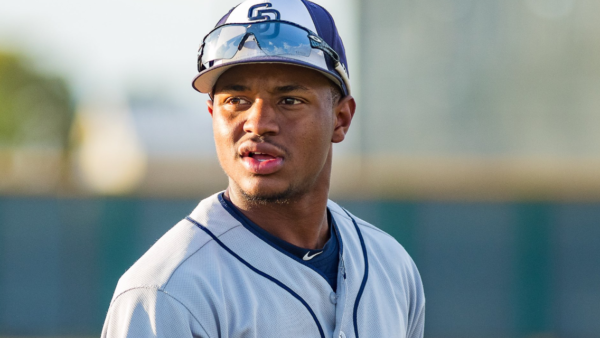 The Padres took their time in dealing Brad Hand, and they were rewarded in obtaining the number one catching prospect in Francisco Mejia. He has a rocket arm and a plus bat from both sides of the plate. Mejia will battle Hedges for playing time and could eventually overtake him. This whole recipe has produced the most robust baseball farm system in the game. The Padres have depth at virtually every position in every level. The team has set itself up for success for a long time. Not every prospect will become a success, but with the vast number of players accumulated, the Padres should have no trouble finding talent every season for the foreseeable future. Next What’s Next for the Padres’ Manuel Margot? Yeah, the Padre farm system is stacked so deep and wide with high ceiling prospects, I know a few may be overlooked. However, for a guy who went from short season Tri-City to AA (playoffs) in his first, SHORT year (i.e. he was still playing college ball last spring), and slashed .336/.386/.460/.846 his first year of professional baseball, I would think he would rate somewhere on your list. Plus, he played a very polished plus-level shortstop, a premium position. Add in a little power which should reasonably come as his game matures, and he’s Tatis II. The only real “knock” on Miller is that he’s an “old guy” at age 22, in a system filled with platinum prospects aged 18-19 years old, but that should be offset by his substantial college experience. He may not necessarily be a “high floor, high ceiling” prospect, but he’s very likely a “high floor, mid-ceiling, ready for the show within 1-2 years) prospect. This was nice. Like taking a trip down memory road. (Oh yeah, I remember that trade!) Thanks for writing it! Great article, but one question. Why isn’t there any mention of Osvaldo Hernandez. He had a very big year last season at Ft Wayne, but seems to be overlooked by all. Is there something I am missing about him? Trea Turner has posted 10 WAR combined for very little cost. Is currently projected to do double Myers projection in 2019. Is 3 years younger than Myers and plays a premium position. Myers has only 6.8 WAR during the same time, his cost is 5 times that of Turner. Ross is a starting pitcher who is projected for 0.4 WAR this year coming back from injury. Both G. Reyes and J. Castillo are RP who are both projected to pitch most of the season in the minors again. Both combined gave a 0.0 WAR projection. I’m still trying to relate this post to the rest of article. Maybe he posted it to the wrong article by mistake, i dunno …. 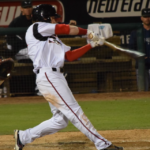 Nothing in the post about the spectacular job AJ Preller & the Padres baseball ops department has done to turn a Padres “top farm system” of 2013 with low depth and filled with low-floor, low-ceiling prospects into arguably one of the best minor league systems of high floor, high ceiling prospects, with depth in these prospects going 3, 4, and even 6 deep. An oversight, I suppose. Regards, and have a fun baseball year rooting for …whatever team you root for! Great Job with this breakdown 👏. An excellent look at how all these moves paid off. Really enjoyed it and the prospect breakdowns as well. I have the answer to why we never had a great farm system. Look at the general managers who have been involved in the organization. Expansion teams don’t usually get good farm systems, and the Padres were a collective of castoffs in 1969. Ballard Smith, was not a great GM, Jack McKeon was a “trader” for talent, Kevin Towers was a core player and build around type. Others have had little success. The history of misses vs hits in the systems history is well noted too. Mike Ivie, and many others were busy, bad trades that sent talent for poor returns, and talent that didnt have the ability to go as far as expected in the game. We have had a poor history, but we have a guy now, who has proven himself able to get talent, and now we need to have it pan out and earn our needed respect in the game. Look at the organizations that have perennial resources, all have had GM’s that were proven. Yes, poor decisions are also inevitable, but maybe those days are few and far between. 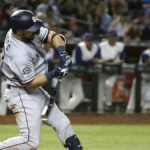 Preller has a good eye, the team has more revenue than ever before, and the reputation for being a winning team instead of an also ran is now realistic and inevitable, finally. I am in Louisiana, but follow the Padres, as I go back to the PCL days with my dad in 1963 went to my first game. I was there opening night in 1969, I lost my taste for baseball with the strike, and just got back I to the game in 2005. I didn’t follow them from 87 till 2005, but I am now on board for the long term, and I am really excited and optimistic. I’m as much of an AJ Preller booster as anyone. He is uniquely talented, and more than that, he’s bold. * Ownership: Other owners (like Moore) have talked the talk, but never really walked the walk. Moore (in my mind) was merely an investor passively interested in baseball as a vehicle for obtaining huge profits redeveloping choice property that he gained ownership or control over during the Petco Park development. Nothing wrong with a little capitalism, but that kind of capitalist isn’t dedicated to the Padres development as much as his own interests. He proved that when he walked away with over 10% of all future Padres broadcasting revenues for the next 20 years, when he sold the team. On the other hand, the owners group put together by Fowler and Seider are baseball people, interested in developing a winning franchise, to their own profit perhaps, but also to the profit of the fans of San Diego. 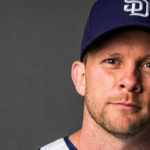 They invested $80M in one year ALONE on nothing but PROSPECTS, more than several years team salary during the Moores/Moorad years, and actually, a total of $95M in that one year alone, for the Padres future years down the road. Of course, they’ve spent money in other significant areas, but the farm system doesn’t put people in the seats or revenue in the bank for YEARs, and it’s 100% at risk capital, i.e. it’s a crap shoot. That’s dedication like the fans of San Diego have never had before, and I (as another – now out-of-state fan), appreciate it. * Culture: What a GM can do is only partly constrained by the owners $$$ invested. It’s also constrained by the demands of the fans and expectations of the owners. It’s a tribute to both, and particularly the fans, that we have “kept the faith” and waited for the product to develop, without walking away. I rarely see that virtue attributed to the “laid back fans” in San Diego. Most GM’s worked towards “this year and maybe next”. AJ Preller has had a long term vision that he never waivered from. 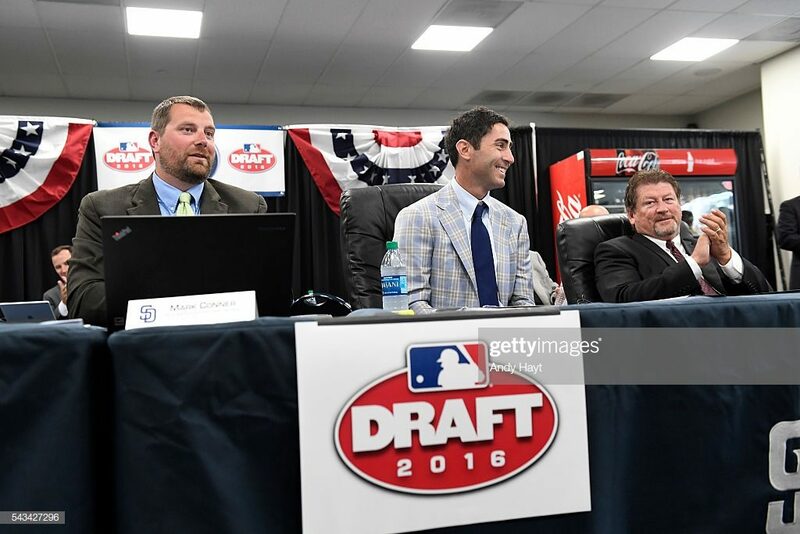 In fact, I think he went ahead with his “win-it-all-now” crap shoot of 2015 planning for the future, knowing that the current “top ranking” farm system was a mostly “low floor, low ceiling” system which held maximum value before any of the prospects stepped onto a major league ball field. He turned those prospects into stars to created better prospects. I’m sure he was looking at the 2016 International draft year when he interviewed for the job, and in fact, that was a major part of his presentation to the owners that got him hired pronto, hands down, unanimous vote. Yeah, I’ve “bought the kool-aid”. No, I have no expectation at all that the number prospects transforming into MLB players for this farm system will greatly exceed the norm. However, I can count, and the Padres have the numbers (i.e. high floor, high ceiling) to swamp the historical percentages. I certainly have a hope that we’ll see more than one or two super-star-studs coming out of the system. 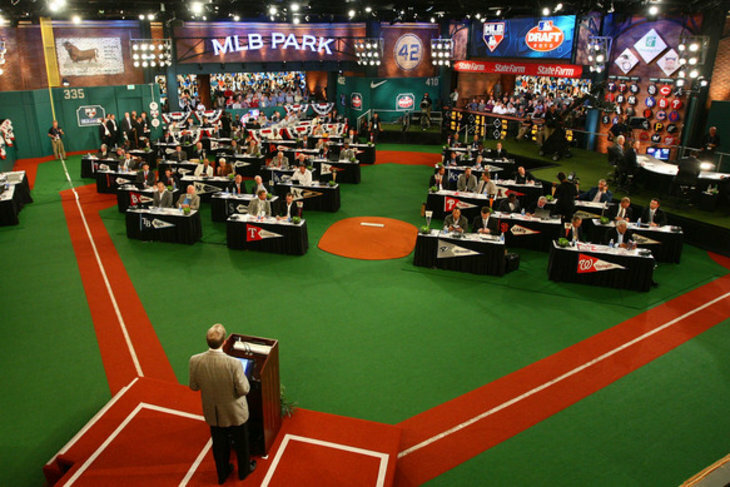 But I am certain that at least one or two will hit, and that a couple of dozen decent to high level major league players will come out of the system as currently stocked. Here’s a big difference: When Donavan Tate and Matt Bush were busts, we all felt like it was over, that the Padres entire future was doomed. When a high level prospect hits a bump in the road now, we think “Bummer, that’s a disappointment, maybe he’ll go back and work on the stuff, and have a decent future. Meanwhile, let’s look at what the other top 10 prospects are doing, should be exciting …. “. When we heard Cory Luebke was down for TJ surgery after a fantastic rookie year, we thought “oh boy, there goes our top #1 start of the future”, and when he had his second one, “oh no, that’s another two years until MAYBE we can win some games”. Now, we hear that a prospect has Tommy John, and it’s “bummer, but we’ll see ya when you’re back; it’ll be perfect when you hit the rotation because there might even be a spot available for ya then …”. I’m exagerating of course, but the point is no one, or two, or three prospects missing is going to crush the fans. When Drew Cumberland had to retire due to concussion syndrome, it was like “oh, no, we’ll NEVER have a good short stop now”. If we lost Tatis (God forbid), we actually have a half dozen talented SS prospects who could fill the position. Maybe not as well as Tatis, who could be something special, but Tatis by himself won’t make or break Padres teams for the next five years. Padres fans have never had that kind of hope, that kind of reasonable expectations for the team’s future. Time to drink the kool-aid, folks, and jump on board. One thing worth mentioning is the trade with Tampa and Washington. Maybe I am wrong, but – at the time – I wasn’t sure about unloading the talent we sent packing. Maybe Joe Ross and others will develop further, but none , save Trae Turner, have really developed. To have Wil Myers and Jose Castillo shows we at least broke even. Frankly, that’s better than I expected. In the other deals, Fried, etc. may still be coming, but you cannot criticize than talent acquisition over the past few years. A second point worth mentioning: I don’t understand why it took this long to adopt the philosophy and action the current registration e is carrying out. Four decades essentially of not valuing a farm system. ? Thankfully, future days appear much much better! Great job James as always. Looking forward to many winning seasons for The Friars!